As all of my dedicated readers know, I’m a huge sucker for Mexican food. 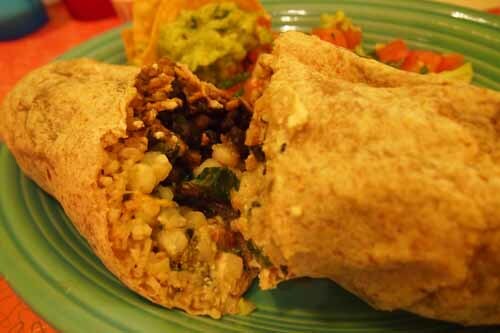 Burritos, tacos, salsa, tortillas, I love them all… if I had only Mexican food to eat and was stuck on a desert island, I would probably be a happy camper. 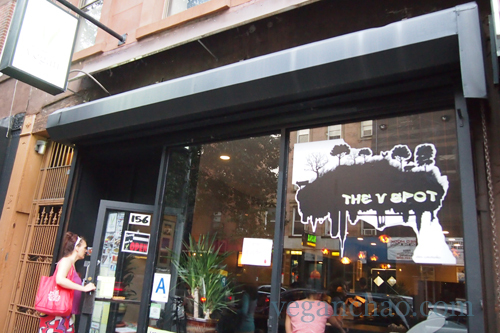 So it goes without saying that whenever I make the trip out to the other borough… Brooklyn, that is, I make it a point to visit Vspot whenever I can. 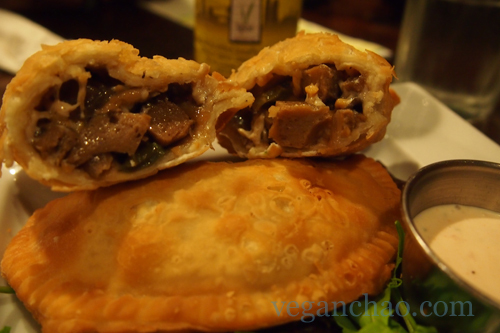 Not only do they have mouth-watering, earth-shatteringly great empañadas ripe with homemade seitan inside a flaky shell, but the prices are pretty darn reasonable for the portion size you get as well. Delicious delights await all who enter! This place is always full of hungry locals, which is really no surprise. Don’t be shocked if you have to wait behind a party of 4-5 people to get seated… trust me, it’s worth the wait. 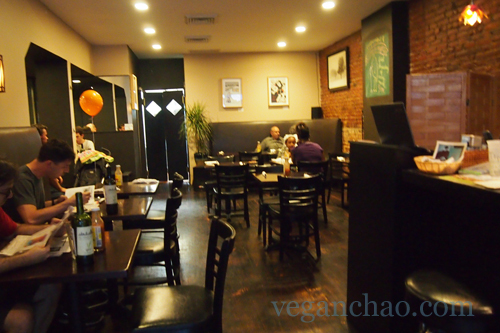 The restaurant also has a mini "bar" area in front for patrons who just want to grab a quick juice boost or shake. Décor-wise, the Vspot has a very homey, casual feel… nothing fancy. Wall to wall exposed brick and weathered wood accents give the place a neighborhood-jointish vibe. Still, it has a lot of character. Though I’ve never been to any of their comedy shows or themed events, I’m sure a good time isn’t too far off in this cozy place. There is also an outdoor area that according to Yelp reviewers, is quite nice in the summer months. Booth seating, on the far left of the picture, offers a bit of a more intimate dining experience (and they’re always hogged up when I get there). Overall, the vspot has a very casual, homey feel to it. Now I must admit, the sole reason I slogged over to Vspot (I live in the boondocks of Queens so it isn’t exactly a joyride for me to get into Brooklyn) was because I had a Groupon that was expiring that week. With that having been said, I would still come back for seconds even if I didn’t have a Groupon, it’s that good. 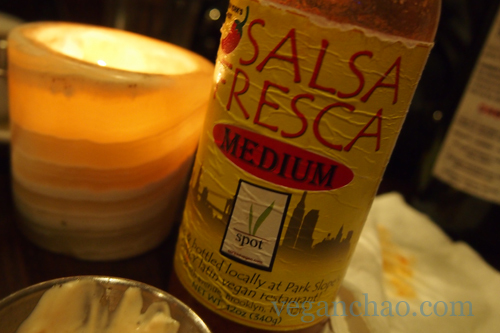 Love that they make their own sauce, seitan, and dressings-- condiments make all the difference! I had a milkshake with candied pecans for a change of pace. 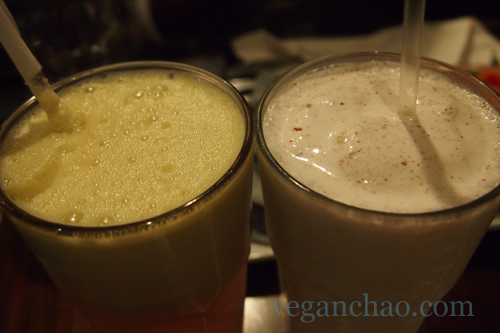 I love milkshakes, and noticed that the vspot had an add-in I’d never tried before – candied pecan. It turned out to be quite tasty and sweet, with bits of nuts melded inside the shake… I kind of didn’t appreciate that there were pieces of nut schrapnel all over the place that get stuck in your teeth and throat, but otherwise I really liked it. I’ve never had their empañadas before, and I’m so glad I did… especially because they offered a PHILLY CHEESE empañada. I mean, how could I miss that?! When have you ever even SEEN a philly cheese empañada before, even in regular cuisine?? Anyway, I jumped on it like a bunny on a baby carrot… and it was AH-MAZING. Like I said, the shell was perfectly flaky, and the filling was equally as stellar. I think the fact that they make their own seitan is great: it really does have a different flavor than your old run-of-the-mill Westsoy seitan (which I’m not knocking— their’s is not bad either). So. Friggin. Delicious. I could've eaten 3... but then I wouldn't have room for anything else. The filling was basically ample chunks of their seitan, with some chili pepper, melted mozzarella and cheddar Daiya, mushrooms, onions, and gren peppers. Overall, it was quite a delectable combination. It came with some creamy veganaise-y dipping sauce, which most resembled a thick ranch dressing. This was definitely one of my favorite Vspot items. The wings are in the upper left square picture. I liked the wings, but not the stick in the middle! 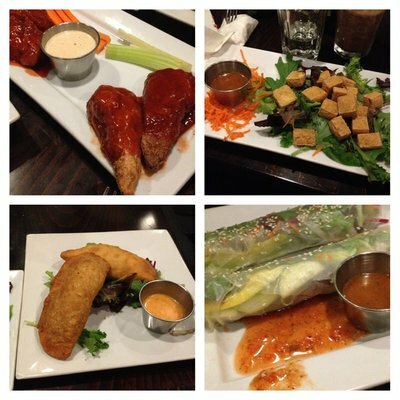 Photo by Melia P.
Another stellar appetizer; except for the weird wooden stick in the middle. I get what they’re trying to do… ok, so the stick is supposed to be like a bone… but this is taking it a bit far. The stick could probably poke someone in the mouth if they weren’t careful! Besides the odd stick, this appetizer was very good: the texture was terrific, the bbq glaze went just right with the wings, and the vegan “bleu cheese” dip added something extra. The base of the wings where you hold it aloft also has this great flaky, crispy tofu skin covering it, which is a great play on texture. Though this is probably just me… but I would probably want to eat the wings with a side of rice or toasted bread, since it’s a very savory item. Yeah. It tastes just as good as it looks. 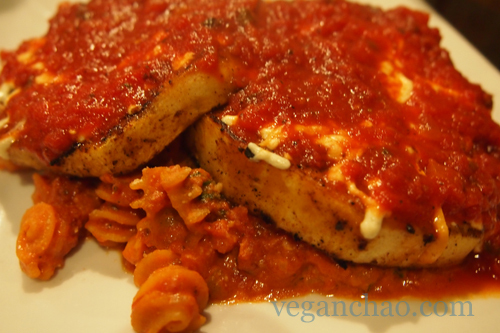 Now on to my entree, this massive, juicy, delicious heap of vegan perfection: two lightly grilled, saucer-size slabs of eggplant smothered in melted mozzarella daiya, homemade Kosher-wine marinara and spinach, atop a bed of whole wheat pasta. I think I just died and went to vegan-Italian heaven. Eggplant can be a tricky thing to cook– so I was very happy to find out that it wasn’t too mushy/firm… it had a bit of char on the surface (though it didn’t taste burnt at all), which added to the texture. They were generous with the sauce and daiya– there was plenty on my plate to sop up with my eggplant. It was all very tasty and I ended up only eating half of it– it really was a huge portion! Great value for just $15.00. My dinnermate Laura ordered this lovely dish, which I of course had to taste. Being the generous pal I am (not) I always make sure to sneak-eat some food from my dining-buddy’s plate, and I’m so glad I did, I ate like all of it! Just kidding. 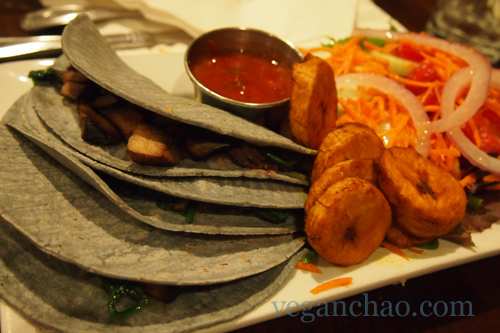 I did get a bite of this scrumptious soft blue-corn taco, which was filled with plenty of sauteed spinach, portabello mushroom slices and came with the best-tasting plantain slices I’ve ever had. The outer shell was crispy-crunchy and the plantains themselves were sweetly tangy, perfectly ripe. I’d say this dish is a bit more healthy than the eggplant parm (it certainly is more colorful! )– buttt I’m really never concerned about my waistline when I visit vspot, so whatever. 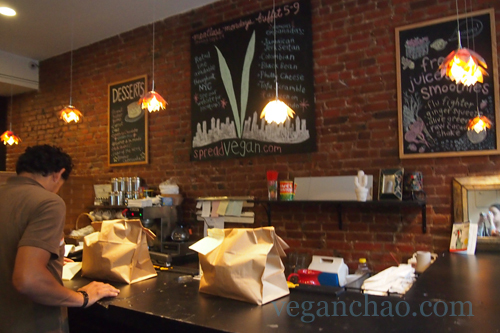 If you want the best-tasting, freshest vegan food in Brooklyn (and I’d venture to say all of NYC!) seriously, you have to visit Vspot. Your stomach will thank you for it… for at least the next 4 hours (longest lasting fullness evar! ).